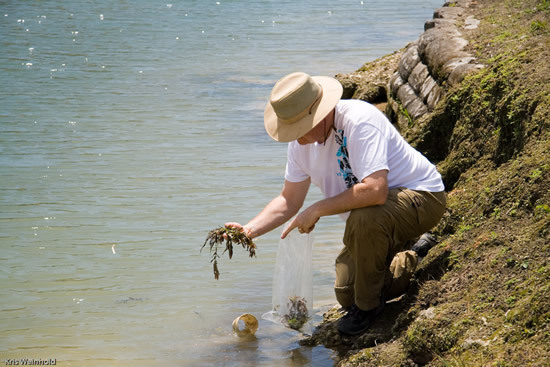 Five members of the Greater Washington Aquatic Plant Association (GWAPA) recently went on a plant and fish collecting trip to Florida. Florida contains a much wider variety of tropical flora and fauna to collect than our local waterways, so I was eagerly anticipating what we would find. Thursday morning, we packed into two vehicles and left northern Virginia, down the long stretch of I-95 that leads to Florida. After many long hours, and quite a few gas stops, we finally reached the Florida state line; two miles until the Florida welcome stop. Pulling into the rest area, we noticed a small runoff area between the parking lot and interstate, so we went over to investigate. Amazingly, in this small pool of water we found a plethora of aquatic plants: Hydrocotyle umbellata, Bacopa monnieri, and Sagittaria lancifolia. Upon closer look, these plants were shading a large group of sailfin mollies and gambusia. What a perfect welcome stop indeed! We stopped outside of Gainesville, spending the night to wake up early for our snorkeling trip to Ichetucknee Springs State Park. While the others were parking, Ghazanfar Ghori and I waited in a small spring-fed pool upstream from the Ichetucknee River itself. In that small pool, we spotted Ludwigia repens, Vallisneria americana, Hydrocotyle umbellate, and two different species of mosses. There were a number of sunfish and bass swimming throughout the pool. The low water levels were readily apparent by the stains on the bank; a good 2-3 feet below normal. We entered the river, taking a moment to adjust to the 70Â° F temperature, before continuing through a very lush area of Vallisneria americana. 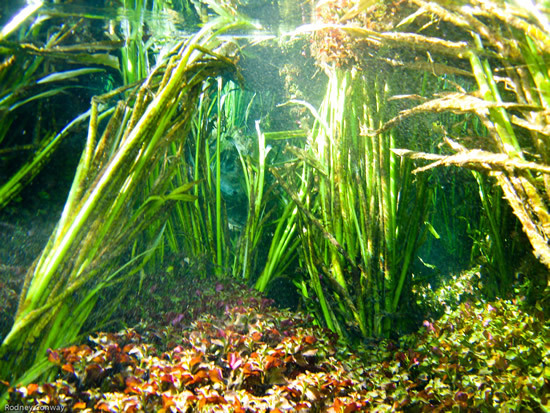 Underwater, the river was lined from bank-to-bank with 2-3 foot long Vallisneria blades, providing ample habitat for the riverâ€™s inhabitants. Flowing with the current, we saw a huge variety of fish, plus some grass shrimp and crayfish. 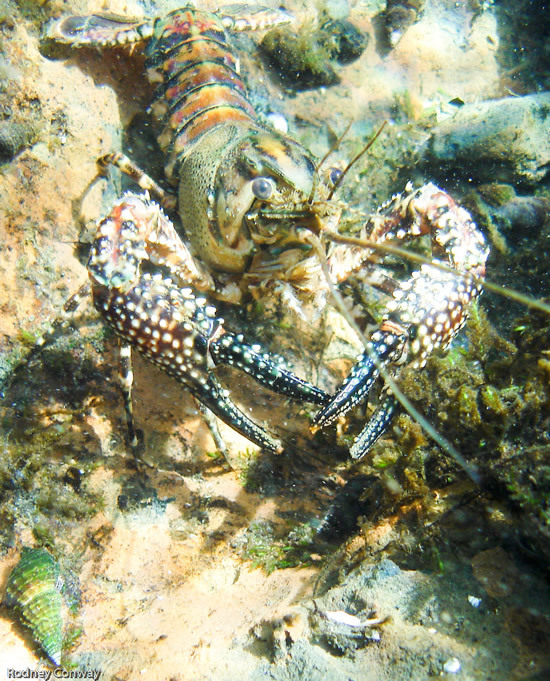 We spent five minutes watching two lobsteresque-looking crayfish squabble over each otherâ€™s burrow, dug into the limestone floor. Snapping turtles swam past us as we continued on, while other turtles sunned themselves on branches floating across the waterâ€™s surface. The size of fish seemed to increase as you went from the riverbank to the open channel. Copper lined minnows, numbering in the hundreds, schooled together through the shallow water near the riverbanks. After a bit more than three hours, we came to the end of our swim. Exhausted, we found our cars, and made our way to our next stop. Near the University of Florida, we pulled over at a roadside ditch next to a typical suburban shopping center. 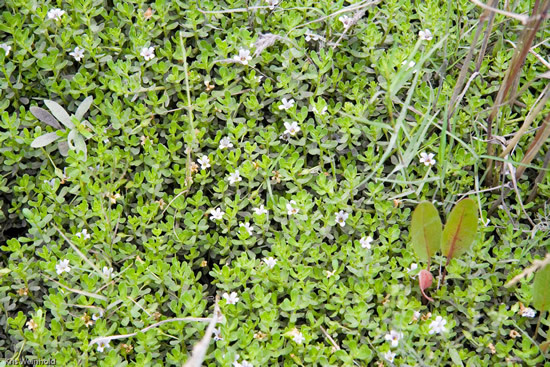 In the stream we spotted a patch of Bacopa monnieri, emersed and flowering. Lots of gambusia were present, but little else to get excited about. 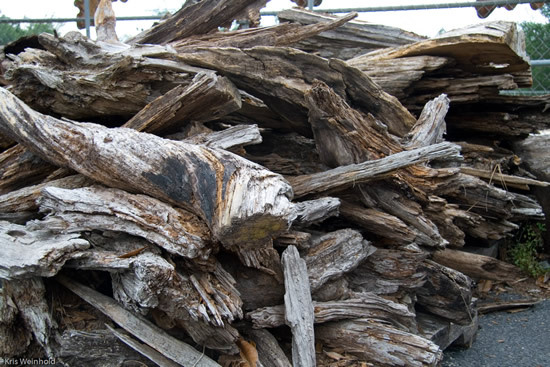 Piling into our vehicles, we headed toward Tomâ€™s Cypress, a huge supplier of cypress products, including many uniquely shaped branches, suitable for use as driftwood in the aquarium. I purchased a few small branches, before we headed southwest toward Tampa. 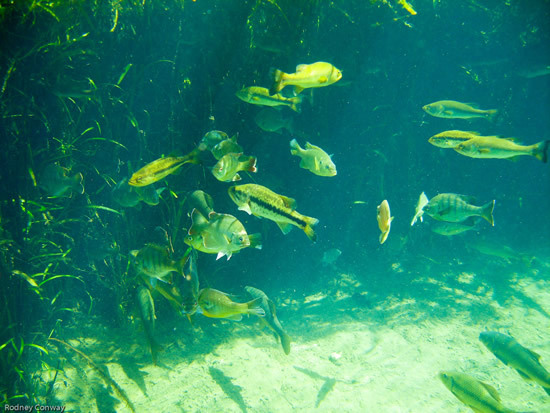 We knew that ornamental fish are the number one air freighted commodity shipped out of Tampa International Airport, so with that many fish farms in the area, some exotic fauna seemingly must have escaped into the local waterways. With a few fish farm addresses loaded into our GPS unit, we started driving through the rural areas surrounding Tampa. Near what appeared to be the start of a new housing development, we came across a pond and canal that looked promising. Approaching the pond, we saw a foot-long alligator gar preying on mosquito fish. Streaming our dip nets through patches of hydrilla, we found two very interesting fish, but unexpectedly, not the non-natives we had thought we would find. First, we scooped up a net full of bluefin killies (Lucania goodie). Then, in our fine mesh nets, we started catching some Heterandria Formosa. This one ditch contained the two fish that Rodney and Michael had most sought after for this trip. We never did find any ornamental fish in the waters surrounding Tampa, but this changed as we crossed the state on our way toward Miami. 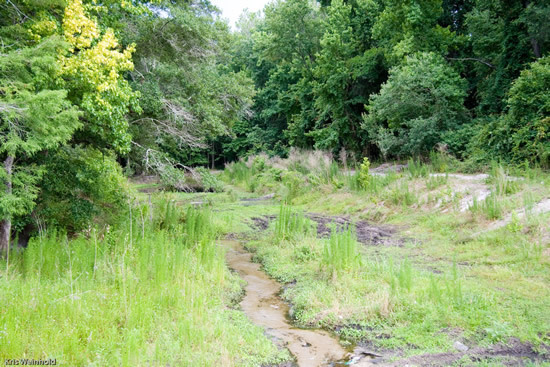 Somewhere in the center of the state, outside of Zolfo Springs, I walked down the bank of another creek to see what Ghazanfar was looking at. â€œLook,â€ he exclaimed, pointing his finger about 3 feet from the bank where two large, foot-long Hypostomus plecostomus were casually resting. 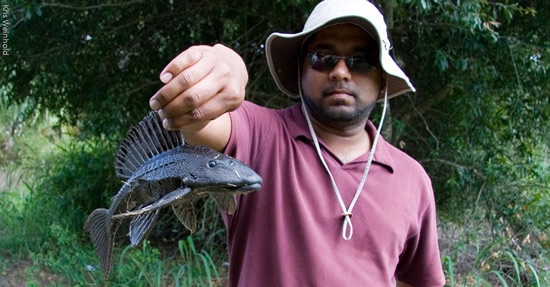 Slowly, Ghazanfar lowered his net into the water, and missed both fish, spooking them into deeper water. Five minutes later they returned, but wisely avoided our second attempt. Then, down the bank, Ghazanfar shouts that heâ€™s netted a large one. 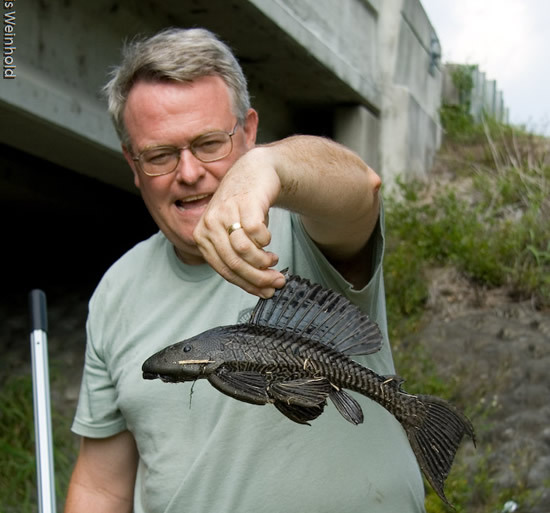 We all took turns getting our pictures with the pleco before continuing toward Miami. After stopping at Lake Okeechobee where we got our only picture of a Florida â€˜gator, we drove just north of Miami to Davie, FL. Michael gets a pleco picture too. In and around Miami, canals weave throughout housing developments, paralleling many roads, which then give access to the waterways via public boat dock. Our plan for Sunday consisted of finding these public boat ramps, and seeing what, if anything, the canals contained. Our first stop was a boat dock behind a large outdoor shopping center. We started walking along the canal bank, looking for any signs of life. Patches of brilliantly red, and equally invasive, Hygrophila polysperma were growing throughout the canal, but few signs of anything else living were present. Then, after trailing the bank for 300 yards, we spotted a large group of Mayan cichlids (Cichlasoma urophthalmus) swarming around a sunken office chair. In among the Mayans, a small number of Jewel cichlids (Hemichromis bimaculatus) were darting in and out of their limestone caves. Unfortunately, this area of water was too deep for us to successfully net any of the fish. We started heading back to the car empty-handed when Ghazanfar decided to try swooping the net through one of the Hygrophila patches. To our luck, five small cichlids appeared in the net! Continuing this process, we ended up with a large collection of the Mayan and Jewel cichlids, an assortment of darters, and even a young pleco, measuring only half an inch in length. 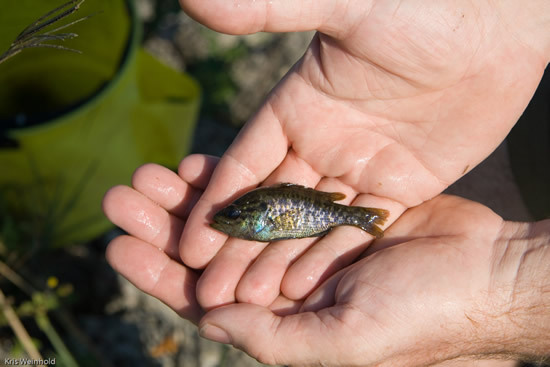 We later continued this same collecting method at another canal, finding another color variety of Jewel cichlid, plus some very nice shiners, which sported a red splash on their tail and black horizontal line across their body. Additionally, another plant was added to our list as we found a species of Aponogeton in a pond near another boat dock. All in all, a very successful day! 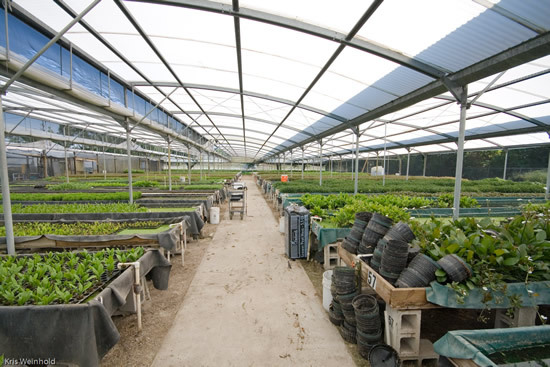 Monday morning, we headed for our scheduled tour of Florida Aquatic Nurseries (FAN), a wholesale provider of potted and pond plants to stores across the United States. If your local fish shop only carries a limited variety of potted plants, itâ€™s probably not because there arenâ€™t others available to them. 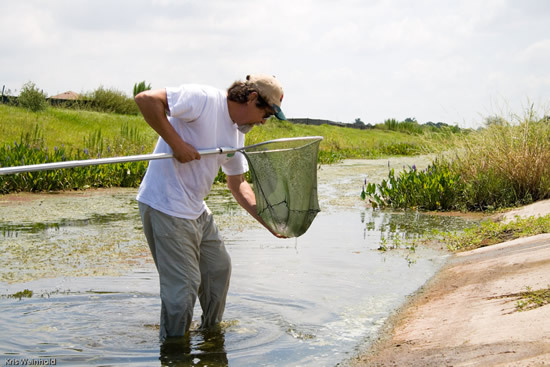 Hundreds of species of aquatic plants populate FANâ€™s five and ten acre facilities. A large number of the plants are actually grown emersed, using hydroponics, to prevent algae growth, and allow faster to market times. That said, there are a least a hundred concrete pools containing all but the most obscure varieties of aquatic plants in the hobby today. 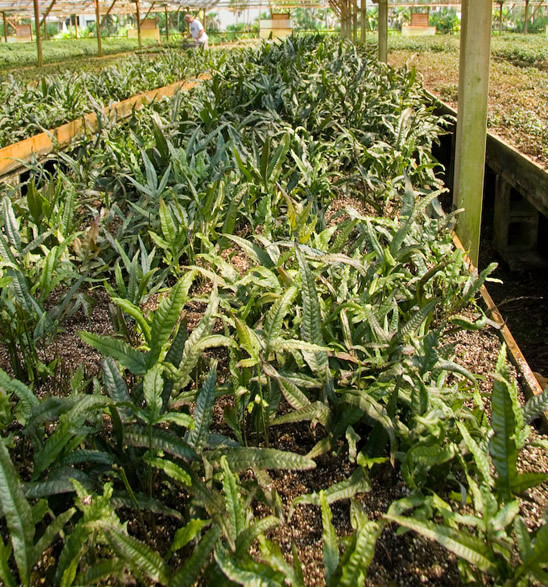 Fields of Java fern and Anubias line their greenhouses, waiting to be individually potted and shipped. Brad, the owner, rattled off the growing requirements and names of every plant on location, as well as, offered insight and advice on many other varieties of plants that advanced hobbyists keep. When we spotted the recently commercialized pots of Hemianthus callitrichoides (HC), we knew that itâ€™s only a matter of time before this and other fine plants are easily available to the masses. After an eventful trip, it was finally time for us to start the long drive back up the east coast to the D.C. metropolitan area. We made one last unfruitful stop at a location, purported to contain croaking gouramis — supposedly a remnant of a long-gone fish nursery. From there, we had another 14 hours in the car, listening to the hum of battery-operated air pumps, doing their best to keep our fish in good health. I hope to make this trek an often-repeated trip, and recommend to everyone that they go investigate what is in and around their local waterways. You never know what you might find!